Hybrid IT is becoming the ‘new norm’ in today’s enterprise landscape. In such a scenario, organizations of all sizes across the industries are orchestrating their daily business operations to cope with changing and increasing demands on the business, and at the same time adapting plans to counter interruptions raised by unanticipated resource changes. The way to achieve this lies in orchestrating a stable and trusted server infrastructure platform like the one offered by Red Hat. Being a leader in open source platforms, Red Hat is providing the exclusive open source model, supplying enterprise computing solutions across physical, virtual and cloud environments that reduce costs and improve performance, reliability and security. Red Hat is especially providing an Enterprise Open Stack platform to curate all the IT demands by delivering the next-generation core IaaS and secondary IaaS+ infrastructure for private and public clouds. In addition, Red Hat also delivers Open Shift Platform which is empowering developers to work efficiently. In the near future, trends like application development along with OpenStack consolidation and the rise of the software-defined datacenter as well as application container infrastructure are expected to drive enterprise operations. Many organizations in partnership with Red Hat are jointly engineering enterprise grade solutions based on OpenStack and OpenShift, to help customers move to and deploy highly scalable technology. In this scenario, to help CIOs find the right Red Hat Solution Providers for their enterprises, a distinguished panel comprising of CEOs, CIOs, VCs, analysts including CIOReview editorial board reviewed the top companies in the Red Hat space, and shortlisted the ones that are at the forefront of tackling industry challenges. 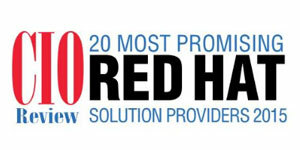 In this edition of Red Hat special, we bring to you “20 Most Promising RedHat Solution Providers of 2015” featuring the companies creating an impact in the Red Hat sector. BlackMesh A Company offering fully managed services, and delivering cloud-based solutions to businesses of all sizes. CFEngine A company specializing in IT Configuration Management, Distributed IT Configuration Management, Datacenter Automation, Distributed Data Center Operation. Chef Software A company producing software that allows IT departments to streamline the task of configuring and maintaining servers in an efficient way. Crossvale IT Solutions Provider and GSA Schedule Holder providing comprehensive IT solutions including product acquisition, systems integration, consulting and training services. Emergent A company offering a comprehensive portfolio of open source solutions from Red Hat. Function1 A company enhancing enterprise technology with a focus on Operational Intelligence, Web Experience Management, Storage, and Security. INetU A provider of globally managed cloud hosting solutions. Mainline Information Systems A company offering comprehensive technology solutions encompassing server, storage, software, application solutions, services, and financing. Media Driver A company providing cutting-edge Enterprise Service Bus software services specifically on the Red Hat Fuse stack for 5 years. Nexus IS Providing expertise in end-to-end technology solutions based on areas such as Collaboration, Data Center, Cloud and Enterprise Networks. opensourcearchitect Provides organizations access to a range of enterprise open source products, services and training in partnership with Red Hat. PLUMgrid A company offering multi-tenancy, security, scalability for the client's cloud virtual network infrastructure. Savant Information Technology A company specializing in Infrastructure Networks and Information Security. Sightline Systems A company offering a real-time operations intelligence solution focused on analytics, root-cause analysis and correlation of data from any source down to the process level. Sirius A company delivering cloud strategy, architecture and integration services to enterprises, service providers and SaaS providers. Solinea A Provider of Technology Solutions, Systems Integration, Expert Service and Support. Tintri A provider of smart storage system that can see, learn and adapt and enable IT departments to focus on virtualized applications instead of managing stoarge infrastructure. Unitiv Offers services that unites business with technology through IT solutions that include Cloud Solutions, Data Management, Support Services, and Professional Services. Userful Corporation A provider of simple, affordable and centrally-managed virtual computers, from desktops to stunning video walls. Vizuri An IT consultancy focused on modern software architecture, tools, and processes. Specializing in Red Hat emerging products, JBoss Fuse and Fuse Service Works, BPM/BRMS, OpenShift and CloudForms.